MCALLEN, Texas (CNS) — Some had been on the road for weeks, others for days, and some entered looking haggard and sunburned with little more than the clothes they were wearing, some holding the hands of their children as a group of Catholic bishops joined a chorus of hands applauding in welcome. Sister Norma Pimentel, a member of the Missionaries of Jesus, who is executive director of Catholic Charities of the Rio Grande Valley, asked the bishops visiting the center during the arrival of the recent immigrants July 1 if they could help serve food to the children, whose eyes lit up when they saw fruit or soup and the smiling faces of volunteers replenishing their dishes and asking questions. “Does the soup taste good?” Bishop Daniel E. Flores of Brownsville asked in Spanish, as some children shyly nodded toward the prelate. Nearby, the president of the U.S. Conference of Catholic Bishops, Cardinal Daniel N. DiNardo of Galveston-Houston carried a tray with bowls of soup into the room filled with children’s voices. Cardinal DiNardo was leading the delegation of bishops toward the border communities in the Brownsville-McAllen area close to the southern border with Mexico July 1 and 2. The visit to what’s known as the respite center run by Catholic Charities in downtown McAllen quickly took the prelates into the heart of the human drama of migration and its human toll. A woman traveling with a 3-year-old said that along the way she’d heard children were being taken away from parents and she prayed that it wouldn’t happen to her because returning to her home country of Guatemala was not an option — either way she risked losing her child. Cardinal DiNardo, along with Auxiliary Bishop Robert J. Brennan of Diocese of Rockville Centre, New York, and Bishop Joseph C. Bambera of Scranton, Pennsylvania, took the opportunity to speak with as many as they could in the room, addressing topics such as why they left home or simply asking the migrants where they were headed and how they were doing. “Vas a ver la nieve,” he told her in Spanish, telling her she would see snow. “Do you know the Yankees? And the Mets?” Bishop Brennan asked. And the father answered “yes” with excitement. 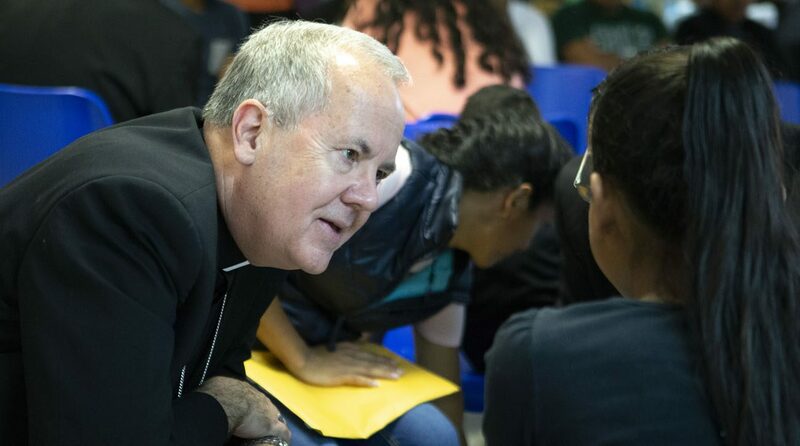 The girl’s father, who traveled from Honduras mostly by foot, later said he was grateful for the great kindness the bishops had shown, how they had treated him and his daughter as human beings and it made him feel that his load had finally lightened after a long and hard journey. “This gives me a deeper understanding of the experience that many of our folks went through to get the point where I’ve come to know and love them on Long Island,” he said. “In this room is the core of Catholic social teaching: the dignity of life,” said Bishop Bambera. “This is what we call welcoming, this is the act of welcoming that we all like to see,” he said, especially knowing about the incredibly difficult journey they had just made. “It’s the moment when our American, our human values come forward and it was nice to watch, people were extremely grateful,” he said. It was uplifting to see a group of people who’ve had a lot of bad things happen to them, “get a dose of good,” he said. “It’s a moment when they’re feeling a small sense of safety. They’re also realizing that they’ve left people behind,” Canny said.